Seema Malaka Temple is assembly hall for the monks at Gangaramaya Vihara temple used chiefly for meditation. 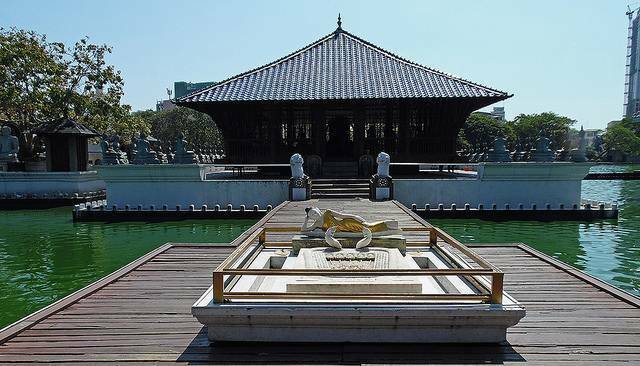 The temple, situated on the waters of Beira Lake, is an architectural wonder built by the most famous architect, also called the “father of Tropical Modernism”, Geoffrey Bawa. Seema Malaka temple resembles the forest monasteries at Anuradhapura which are usually built on the waters and it is a blend of Indian, Sri Lankan, Chinese designs. The original temple that sheltered monks 120 years ago started sinking in the 1970s after which the government ordered it to be rebuilt and redesigned. The present temple stands amidst tall modern buildings and is filled with serenity and tranquillity. It is visited mainly to bTold the stunning design of the temple which has three platforms raised on waters connected by pontoon walkways. The main platform holds the meditation hall. There is a Bodhi Tree on one and a huge library on the other that stores ancient religious texts and which is not open for people. There are many statues of seating Buddhas on all platforms with different mudras and also Hindu gods.